New World Chardonnay does not get any better! 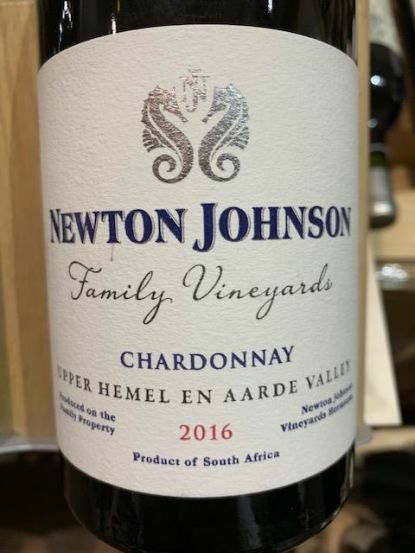 Newton Johnson wines are based in based in the upper Hemel en Aarde Valley near the seaside town of Hermanus, an hour and a half’s drive out of Cape Town. They truly make some fabulous wines and the Chardonnay & Pinot Noir really are the stars of their portfolio. This was the best New World Chardonnay I tasted last year, bar none. Ripe apple, green lime, honey with macadamia nuts. A broader style but with fabulous freshness from the bright acidity, finishes with a creamy mouthfeel and a long, satisfying finish. For me this is a nod towards very fine Burgundy. Find me a better Chardonnay at this price, go on give it your best shot.